40 % of Christians strongly agreed that Satan “is not a living being” but a symbol of evil. 22 % of Christians strongly agreed that Jesus sinned when he lived on earth. 55 % of Americans believe the Bible is totally accurate in all its teachings. 33 % of Christians agree that the Bible, Koran and the book of Mormon all teach the same truths. What is going on with our faith, our beliefs? When Jesus asked, who do people say I am? He was asking what do people believe about me? Faith is easy to spot on people. You can claim to believe in something, but it won’t be true until people see your action. It is your action that will tell others whether you believe that or not. For instance, Charles Blondin amazed the world in the summer of 1859 walking backward across the tightrope to Canada and returned pushing a wheelbarrow. “Do you believe I can carry a person across in this wheelbarrow?” Of course the crowd shouted that yes, they believed! It was then that Blondin posed the question – “Who will get in the wheelbarrow?’ Of course…none did. There is a serious disconnection between what we claim to believe and how we act. Jesus always applauded faith in people. He could see how much faith they had because they did something, they acted upon what they believed. The woman suffering from bleeding for 12 years, went to Jesus believing that if she touched just his garment, she would be healed. The soldier who told Jesus to just say the word and his servant would be ok. Jesus always told those people, your faith, your belief has healed you. They thought they knew Jesus very well because they could tell who he was related to; the names of everyone in his family; they could tell you what the family business was in town (carpentry). He is the carpenter’s son. How is it that he is a rabbi now? These town people had a limited knowledge of Jesus. They knew some things about Jesus, but they did not know Jesus very well. You can read a biography of someone but that does not mean you know the person. Those people were stuck in what they knew about Jesus; they could not believe he was anything more than what they thought. They were offended by Jesus coming to town as a Jewish teacher. They tripped over Jesus. Jesus felt disrespected or dishonor by their skepticism and lack of faith. Your lack of faith brings dishonor to God, in other words, it doesn’t bring him glory. Jesus was being applauded and celebrated everywhere else, but in his hometown. Everywhere people wanted to see Jesus and invite him to their house, but not the people of Nazareth, they were offended by Jesus because what they believed did not match what they heard about Jesus. Our lack of faith robs us of God’s blessing. It blinds us from seeing God at work in our midst. The people of Nazareth forfeited seeing amazing things in their midst that day. They failed to see God’s glory among them because of their lack of faith. Lack of faith is dangerous for the Christians; imagine a person who profess to believe in Jesus but is still lacks faith in Jesus. 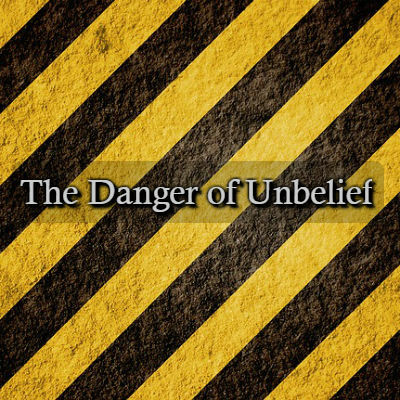 There is a cure for unbelief or lack of faith. -Get a bigger perspective about Jesus. Get to know Jesus better through Bible study and prayer. When you spend time with Jesus, it will change your perspective; you’ll get a broader version of Jesus. You will trust him enough to jump on the wheelbarrow if he is the one holding it. Our faith in God must be more than just a song we sing; it must be lived out through our actions. Is God being honored by your faith or being discredited by your lack thereof? What we know about Jesus must be put in practice if we want to develop strong faith. Jesus said that it’s not just hearing his words but acting upon what you hear. Whoever hears these words of mine and put them in practice is like a man who built his house on the rock. This man’s house was strong enough to withstand, floods and strong wind. Your faith in Christ will also be that strong when you put in practice Jesus’ teaching. Knowing Jesus is the cure for lack of faith.